The Darien Blue Wave celebrates in front of their fans after a goal during the second period of the FCIAC boys hockey semifinals at the Darien Ice House on Wednesday, Feb. 27. 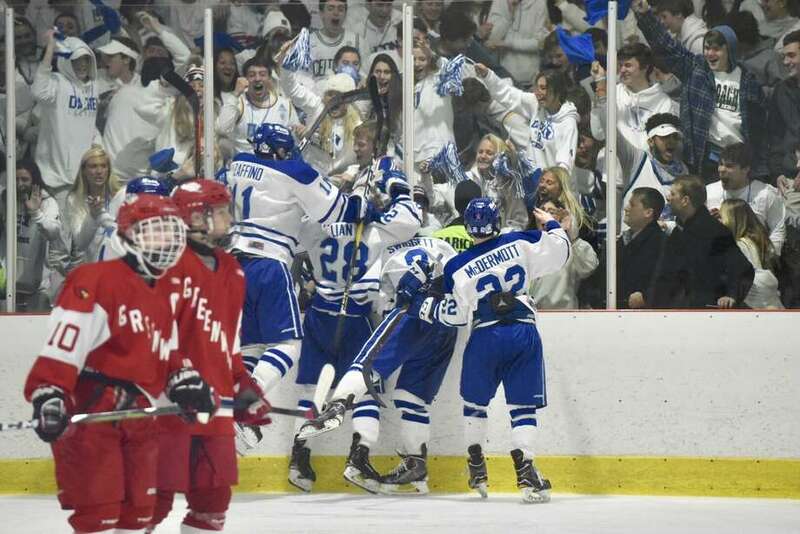 DARIEN — When Greenwich’s Charlie Graves scored in double overtime to give the Cardinals a dramatic 2-1 double-overtime win in the FCIAC boys hockey semifinals on Wednesday, there was no one happier than Charlie Zolin. After making 46 saves, the Greenwich freshman goalie was exhausted. With that, the Greenwich Cardinals are headed back to the FCIAC final for the second consecutive season and for the fourth time in the past five years. It’s an unexpected scenario for the Cardinals, the No. 6 seed who has now knocked off No. 3 New Canaan and No. 2 Darien in back-to-back playoff games at the Darien Ice House. Greenwich (11-9-2) will square off against the No. 1 Ridgefield Tigers (21-0) for the FCIAC championship at 6 p.m., Saturday, at Dorothy Hamill Skating Rink in Greenwich. Ridgefield routed the Stamford/Westhill co-op, 8-1, in Wednesday’s other semifinal game. The two teams squared off in last year’s final, with Ridgefield taking home the championship trophy. Graves’ goal ended an instant classic which lasted more than 65 minutes and featured many big plays at both ends of the ice. Darien (16-5) outshot the Cardinals 47-24, but the play of Zolin and the defense held up under the pressure. Graves’ game-winner came off a deflection. Sean Pratley got the puck to Dylan Madden for a shot from the top of the left circle, and Madden’s shot ricocheted off a player in traffic and popped out to Graves. Graves fired the puck into the open right side of the net and the Cardinals piled onto the ice in celebration. The goal ended a scoring drought of more 63 minutes for the Cardinals, who found the net in the first two minutes but were then held scoreless by Darien’s defense and goalie Henry Pfeifle (22 saves). As it did against New Canaan in the playdowns, Greenwich came out of the gates flying, generating three attempts in the first minute. The attack paid off when Jack Eschricht cleaned up with assists from Julian Ribushofski and Jake Shredders at 1:41. The Cards nearly scored again a minute late when a shot by Pratley hit the stick of Pfeifle and slid free near the line. Pfeifle dove back to knock it away. Zolin stood tall again, stopping eight Wave shots in the first period and then blocking a penalty shot by Darien’s Bennett McDermott early in the second frame. A delay of game penalty against the Cards during a scramble in the zone resulted in the shot, but McDermott’s attempt low to the left pipe was knocked away. Darien’s offense heated up and the persistence paid off when Blake Swiggett scored at 5:47 of the second period. During an odd-man rush, a shot by McDermott was blocked by Zolin, but Swiggett was there for the rebound and knocked it home to tie the game at 1-1. In the third period, Darien outshot Greenwich 11-3 and in the first overtime, the Wave had a 12-5 advantage. Zolin and the defense, however, continued to put up goose eggs. Charlie Zolin, Greenwich. For the second straight playoff game, the freshman goalie shut the lights out on one of the FCIAC’s top teams. This time, he made 46 saves, stopped a penalty shot and the lone goal he allowed came on a rebound.